There’s life in the old dog yet – the current renaissance of the block bottom bag in the field of high quality packaging punishes its competition for its lies with the help of its unbeatable advantages over automated, manufactured tubular bags. Block bottom bags create a rectangular form through their side folds when being unfolded and have the special features for a stable base. 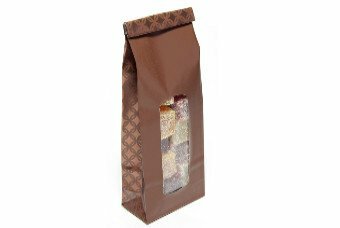 Owing to the smooth bottom it is capable of standing even without content which makes the filling of the bag easier. Improving stability and visual revaluation the bottom can be reinforced with a sheet of cardboard. Various combinations of materials with or without windows protect your product from damaging influences. Partial lamination using paper or aluminium ensures a very special haptic effect and signals stability, quality and safety.